I put quite a bit of time and thought (and sometimes money) to find the right artwork to accompany my perfume posts. Translating smell into words requires some bending and maneuvering* and the perfect image can help greatly. Sometimes, I find, it can actually help you write. Even the search for the image itself becomes part of the process, distilling the way I experience a scent into a clear picture. Case in point: the latest Jo Malone perfume, Mimosa & Cardamom. It's a nice perfume. It's especially nice if you love mimosa. From the opening notes you get that old Jo Malone feeling of a really really well made soliflore (as described perfectly by Victoria of Bois de Jasmin). 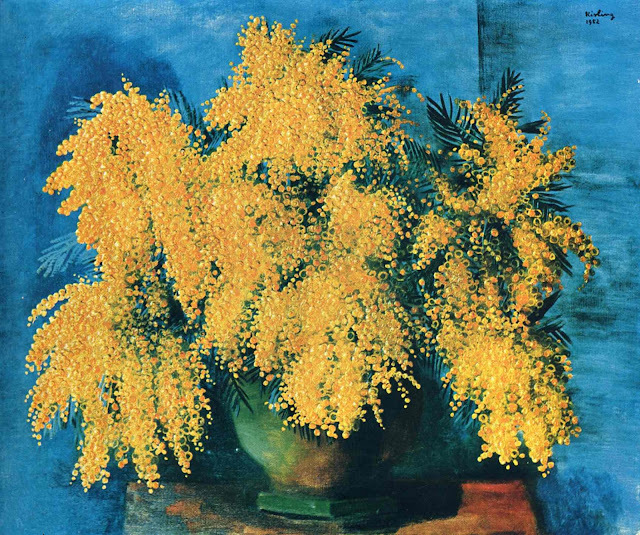 I should be completely in love with Mimosa & Cardamom but I'm not, and the best way for me to explain why is through the still life paintings I chose. The one at the top of the post is how I perceive this perfume from start to finish, my final impression of it: attractive, full of mimosa sunshine (the opening is a touch citrusy), light and lightness, yet still offers a good amount of substance. A major part of Mimosa & Cardamom is just too clean. 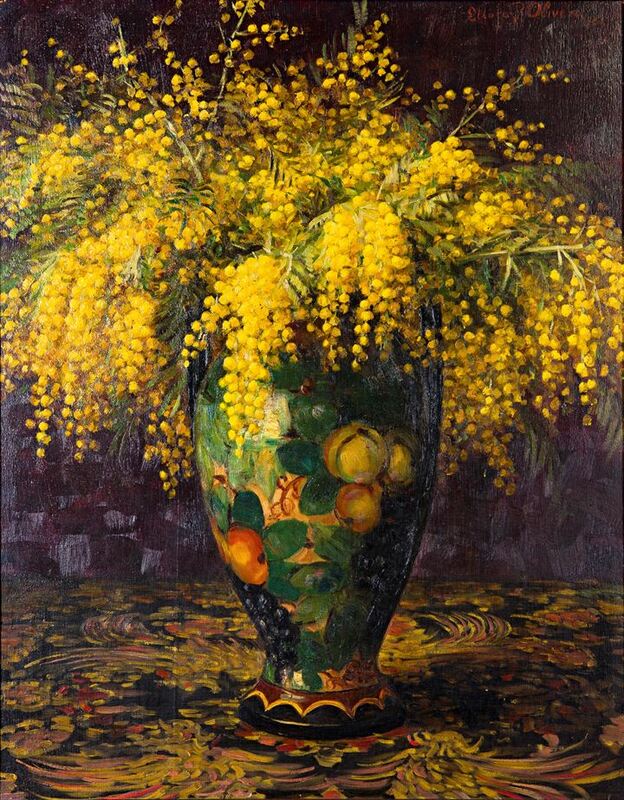 I love my mimosa heavier and honeyed. My favorite example is the limited edition Givenchy Harvest 2007 Amarige Mimosa (while I never liked Annick Goutal's Le Mimosa). It's obviously a matter of taste and expectations, born from my preference for heavier fragrances. There's a water infusion thread that runs through Jo Malone's mimosa (identified by Victoria in the review I linked above as cucumber and violet). It bothers me too much. The linearity of this stage makes it too boring for too long. Not bad, not incompetent, just a bit dull. The same goes for the lack of actual cardamom. Instead we get something warm and buttery that feels smooth and pleasant in the dry-down, but it's not enough. At least not until the late dry-down when the spice is more evident and there's a hint of holiday baked goods that I enjoy greatly. Back to the artwork. I wanted a perfume that feels more like these two Pierre Bonnard paintings, found myself with something closer to the Kisling one and settled for the Pistoletto. I think I'd like it better as a candle. Jo Malone- Mimosa & Cardamom ($65, 30ml) is available from most department stores and at Jo Malone boutiques. The sample for this review came free with a Nordstrom order. * I'm one of those who think you can "dance about architecture". I like your visuals mapping to scent. More evocative of a feeling that doesn't need works. Works for me. The images you choose are invariably amazingly in sync with the perfumes you're reviewing. The time and effort you put into choosing them is clear. And much appreciated. 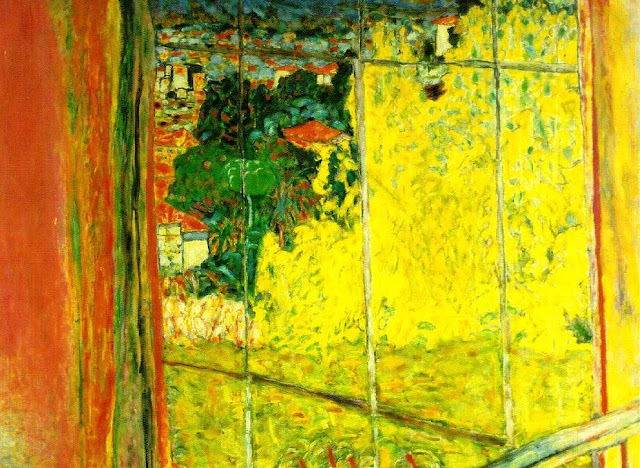 Absolutely love Bonnard and would love to see a perfumer take on the challenge of creating a mimosa scent that matched the essence of one of his paintings. 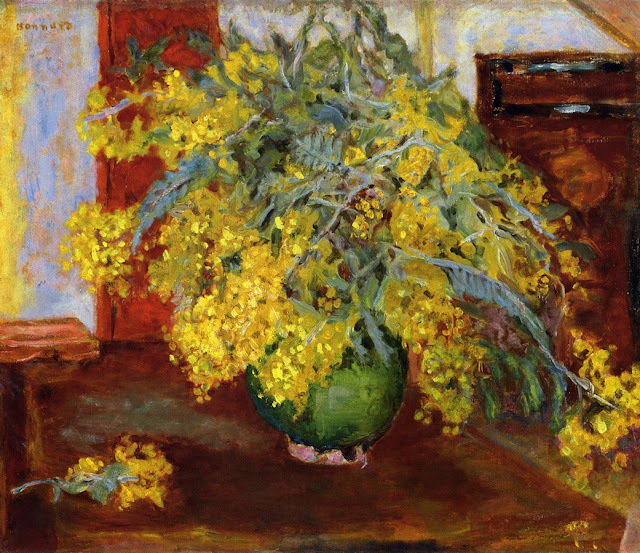 Actually, I'd love to see a perfumer do a whole series of scents that matched the feel of his paintings. Ugh, I hate this perfume! Sorry. Had to get that off my chest. I'm not a mimosa-in-perfume-lover, so maybe that's the problem. Une Fleur de Cassie is probably my favorite of the lot, but I certainly haven't sought them out, so I'm sure there are many many many I haven't tried. (Like you, I don't like AG Le Mimosa.) But this one was terrible on me: it smelled stridently clean in that dreadful so-called modern way. And not a cardamom pod in sight. I couldn't wait till the very end, as you did, to find the spice; I'd scrubbed it off long before. All that said, others may well love this (and I've read many positive reviews). I suppose all I can really say, with conviction, is: it's not for me. I really wanted to like this perfume but it set off my gag reflex, which almost never happens. It smells glorious on my MIL, who is my evil scent twin.... I suspect I'll be smelling a lot more of this before the year is over. Indeed, it is lovely as a candle. Give it a try.